Dental surgery requires special surgical instruments. 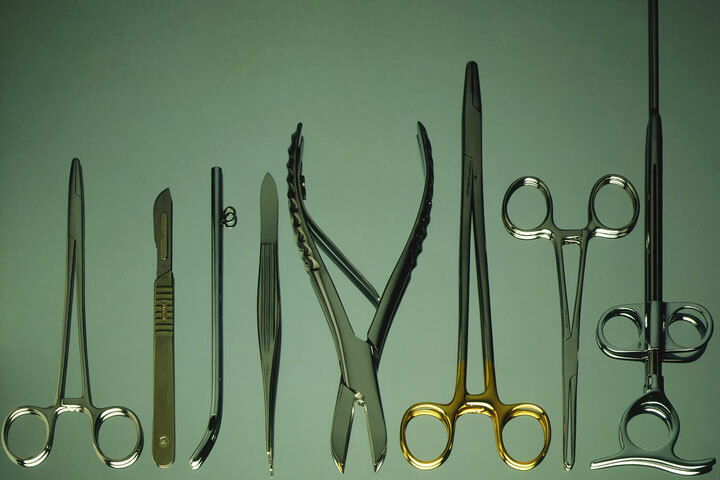 A typical tray in a dental surgical theater might include mouth props and gags, cheek retractors, periosteal elevators, tissue scissors, tissue forceps, and curettes. Sedated patients require devices to hold their mouths open during surgery. For example, a patient may be asked to bite down on a mouth prop, which is placed in the posterior part of the mouth. A mouth gag, is a metal instrument with a locking device, can also be used to keep the mouth of a sedated patient open. Cheek retractors move the cheek and tongue out of the way, improve visibility, and protect tissues surrounding the surgical site. There are several different types of retractors, including Kilner cheek retractors, Bowdler Henry cheek retractors, and Minnesota retractors. This tool is used to separate tissue from the tooth or bone, as well as from the surgical site. It has two working ends: one with a pointed tip, and another that is rounded with sharp edges. Tissue scissors are used for cutting soft tissue during surgery, and can be curved or straight. They come in different lengths and sizes. Tissue forceps are used to grasp and retract tissues, so that the surgical site is better exposed. They can be serrated or rat-toothed, and come in many different sizes. Curettes are used to remove debris or infectious material from the socket of the tooth, and can also be used for tissue debridement. Curettes are available with shanks of different shapes, and can be double or single ended.